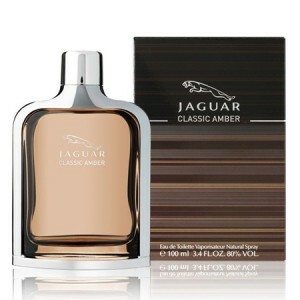 Jaguar Classic Amber is for men who have fallen in love with the tobacco flavor. Jaguar Classic Amber 100ml. Eau De Toilette is for a man who fell in love with tobacco flavor. Delicate, light and at the same time playful scent, which has a unique style and freshness combine with a warm, warm wrap. The creative essence were founded on the sophistication and surprise. Unveil sensuality and highlight their masculinity. Jaguar Classic Amber Eau de Toilette is a large proportion of woody notes, which have a warm spicy character. So you can enjoy amber, grapefruit or resin and black pepper. Interesting and high quality fragrance compositions, which will radiate elegance and luxury. Vial of eau de toilette for men Jaguar Classic Amber is an expression of the strength of these sports cars. Simplicity, which carries chrome fittings and gently brown the inner essence. To be truly successful man who has his sensuality under control, choose fragrance. Do you like classical music? Do you prefer gold watches, suits, luxury cars Jaguar and other brands of fine things, timeless? In this case, you should definitely get a perfume Classic Amber by Jaguar. The rich aroma of this eau de toilette is always perfect, regardless of fashion trends and the preferences of the majority. At any time and under any circumstances, it is best to emphasize your impeccable sense of style and turned the heads of the most splendid woman. Perfume Classic Amber is like a brilliant sculpture, born from a marble monolith. Its upper part awakens and fills with energy, overflowing aroma of juicy grapefruit and mandarin. The main element of the perfume of the statue is made up of slightly sour green apple, cinnamon and delicate orange color. Perfect finish described eau de toilette by Jaguar will remain in your memory for a warm and noble smell of expensive leather, cedar and french labdanum, decorated with sweet vanilla.